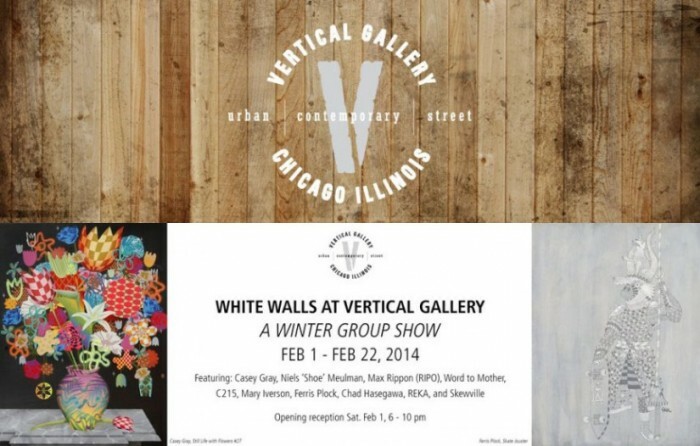 Vertical Gallery is currently hosting White Walls: A Winter Group Show which displays pieces by seven + artists. The Ukrainian Village gallery’s presentation is beautifully curated, making use of its space by providing a beautiful preview of artists Casey Gray, Niels ‘Shoe’ Meulman, Max Rippon, Word to Mother, C215, Mary Iverson, Ferris Plock, Chad Hasegawa, REKA and Skewville. Although the exhibit presents a variety of styles, writers and word lovers alike will thoroughly enjoy the fresh take on the use of typography in art. The exhibit runs through Feb. 22, and we’ve put together a brief bio on some of the artists featured in this showcase. ‘Shoe’ Meulman, an Amsterdam artist and graphic designer, came up with the term Calligraffiti to describe traditional handwriting with a metropolitan attitude – calligraphy and graffiti – a style his work encompasses. He was in his teens when he became a graffiti legend leading to his eventual collaboration with Bando (Paris) and Mode2 (London) to form the Crime Time Kings. His ventures include design company Caulfield & Tensing, partnering with Unruly and launching the Calligraffiti movement in The Netherlands. His website mentions that “his recent painting style can be described as Abstract Expressionism with a calligraphic origin.” Indeed. Max Rippon presents typography and calligraphy along with a generous dose of humor and irony in his text-based pieces which reflect his NYC culture meeting his newfound home in Barcelona. On the other hand, west coast artist Casey Gray is brilliant in his use of mega-color still lifes. They pop out at you in the most rainbowlicious of psychedelic ways. Oh, the sensations! Mary Iverson’s work, compared to all the other artists, is a little more traditional only in the sense that she uses landscapes and natural habitats as her basis. Adding outrageous grids and her interpretation of the painted consequences she feels will overtake our planet because of globalization, the pieces become bold statements. This 8 second video will give you a better idea of Iverson’s work. San Francisco based artist Chad Hasegawa presents pieces that “explore the relationship of creative influence and output, utilizing techniques of artists he admires while staying within a narrow constraint of subject matter,” as seen through his trademark grizzlies. The more you look the more you see in these multi-layered bears. For Paris street artist C215, who’s been compared to Bansky, his main concentration are portraits, especially of those facing difficult struggles. It’s a reminder of what we choose to ignore that is still clearly in our lives… the homeless, refugees, street kids, the elderly. Vertical Gallery is located at 1016 N. Western Avenue and can be reached at 773-697-3846. The gallery is open Tue. through Sat., 11:00 a.m. to 6:00 p.m.
Vertical Gallery is committed to exhibiting and promoting urban, contemporary and street art. Established in 2013 in Chicago’s Ukrainian Village neighborhood, the gallery focuses on work influenced by urban environments, street art, pop culture, graphic design and illustration. Justin Giarla has worked for a decade to maintain White Walls as the premiere destination of urban and contemporary art in the Bay Area. Combined with sister space, the Shooting Gallery and two project spaces, the state of the art 5,000 square foot space is one of the largest galleries on the west coast. Named for its plain white walls, they take a backseat to the real focus: the art.